Starting Lineup Denny Hamlin dominated Monster Energy Series qualifying for the Consumers Energy 400 at Michigan International Speedway on Friday, leading each of the first two rounds and then claiming his second pole of the season. Hamlin covered the two-mile oval with a lap of of 35.504 seconds, 202.794 mph in his No. 11 Joe Gibbs Racing Toyota. It’s the 28th pole of his career. Kyle Busch, also from JGR, will share the front row with Hamlin. Kevin Harvick, Erik Jones and Austin Dillon complete the top five. All-Time Pole Winners | Michigan Pole Winners “I actually wasn’t that confident,” Hamlin said of his fast lap. “I didn’t get all of it, for sure, but the team gave me a great-driving car that got faster on the racetrack. My guys are really stepping up and we’re starting to make a little hay, now.” Indeed, Hamlin has won back-to-back poles after leading qualifying last weekend at Watkins Glen International. “We love to see results when you work so hard,” Hamlin said. “The to..
Denny Hamlin dominated Monster Energy Series qualifying for the Consumers Energy 400 at Michigan International Speedway on Friday, leading each of the first two rounds and then claiming his second pole of the season. Hamlin covered the two-mile oval with a lap of of 35.504 seconds, 202.794 mph in his No. 11 Joe Gibbs Racing Toyota. It’s the 28th pole of his career. Kyle Busch, also from JGR, will share the front row with Hamlin. Kevin Harvick, Erik Jones and Austin Dillon complete the top five. Indeed, Hamlin has won back-to-back poles after leading qualifying last weekend at Watkins Glen International. For Dillon, his Richard Childress Racing team also was well-prepared for the high-speed two-mile oval. Friday’s run actually matched Dillon’s season best of fifth, first established in March at Auto Club Speedway one month after he won the season-opening Daytona 500. Chase Elliott, last weekend’s winner at Watkins Glen, will start 21st in the 40-car field. Defending race winner Kyle Larson qualified 17th while Clint Bowyer, who won this year’s first stop at MIS on June 10, will line up 16th as the final month of the regular season begins. For Elliott and his Hendrick Motorsports team, Friday’s qualifying session was a disappointment. In this year’s first race at MIS, Elliott started 13th, failed to score any stage points and did not lead a lap en route to a ninth-place finish. 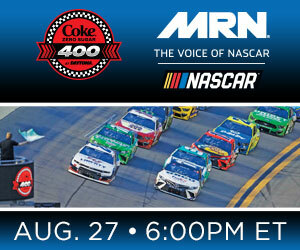 Motor Racing Network – “The Voice of NASCAR” will have live coverage of Sunday’s Consumers Energy 400 from Michigan International Speedway, beginning at 1:30 p.m. (ET) – with live streaming at MRN.com. The post Hamlin Rolls to Michigan Pole appeared first on MRN – Motor Racing Network.